Here to share a couple of little tags I created recently. It's been such a joy to work with vibrant colors and mix them into Holiday crafting. It's also a plus that it brightens these cold days a tad. Have you started planning for the Holidays yet? My mind is full of recipes, fun activities, and crafty ideas I'd like to try, but for now, some fun tags to add to the shoppe will do just the trick! To create the tags, I started with bright pink cardstock, and two Papertrey Ink dies to make the tag shapes: Tag Sale #4, and the Scene It: Basic Backer die. For the first tag, I used Limitless Layers: Circles, to cut out the scalloped peach round, and a slightly larger punch to cut out the white cardstock bit. 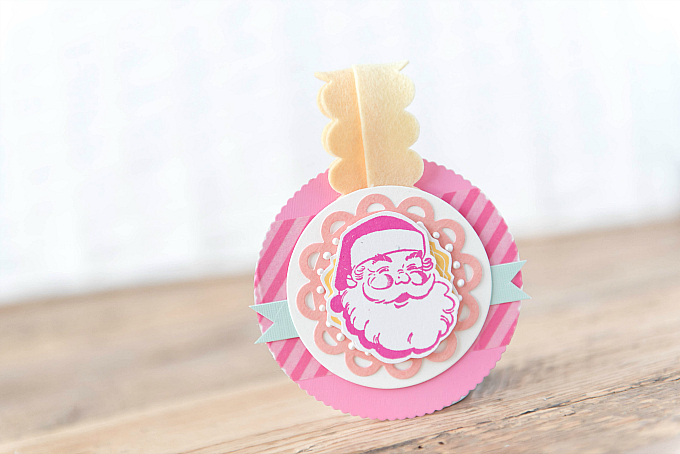 Just on top of that, I layered a stamped Santa Clause image from an old vintage Christmas stamp set. I absolutely love his jovial face and the beautiful vintage detailing of this image. Under the layers, I added a thick, striped washi tape layer, and a little bit of texture with a felt topper (I used PTI's Banner Borders die to create the strips). For the felt, I used Lemon Tart and Harvest Gold from Papertrey Ink. For the ink colors, I used Raspberry Fizz. 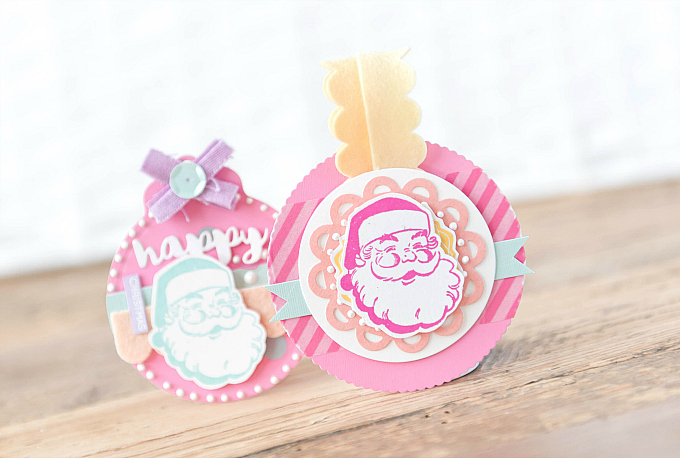 On the next tag, I added another little Santa, stamped in Aqua Mist. Just below, I tucked in a little bit of peachy felt - which I purchased from Benzie Design - one of my all-time favorite felt shoppes. Their colours are luscious and the quality of the felt is perfect for die-cutting. Not quite as thick as PTI felt, but definitely a much better quality and blend than what can be found at most craft stores. To finish the tag, I added a die-cut sentiment from PTI's Super Succulents dies, and a little bit of fabric to dress the top. A few liquid pearls and this tag is all ready to deck out a special little gift. I'll be back soon to share more Christmas creations.